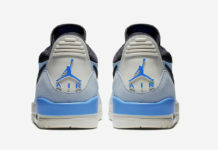 Don C and Jordan Brand will soon be debuting their newest collaboration, the Air Jordan Legacy 312, and hybrid model that combines elements of the Air Jordan 1 and Air Jordan 3 with the strap of the Air Trainer. One of the pairs that will be releasing comes dressed in a Sail, Black, and Storm Blue color scheme. Its name Legacy 312, is a reference to the area code for downtown Chicago, to represent the legacy of Jordan Brand and where Don C came from. The shoe features a Sail/White leather upper with Blue overlays and Black detailing. Its Air Jordan 1-inspired tongues are branded with “Just Don” while having the signature Wings logo on the ankle and Swoosh along the sides. A strap adds for a nice fashionable touch, while resting atop an Air Jordan 3 designed sole. Look for the Air Jordan Legacy 312 “Storm Blue” to release on July 14th at select Jordan Brand retailers and Nike.com. The retail price tag is set at $160 USD. UPDATE: Nike releases official photos of the “Storm Blue” Jordan Legacy 312 that’s expected to release on July 14th.